hope and death, fight and surrender. This is a bolder, grittier L.B. Simmons and I loved it! The story isn’t a pretty one, in fact, it’s a story defined by death. Darkness. Surrender. It tells the story of a girl who at a young age experienced the kind of permanent heartache that shattered her, leaving her former self in pieces. She transformed herself. Became a shroud of pain. A facade that hid everything deep, that protected anyone she ever cared about and scared away anyone who dared to approach. Aubrey Miller believed she was death personified. So she killed Aubrey and became Raven. When Raven arrives for her first day of college at Titan University. She ensures every element of her carefully crafted mask is in place. The black and blue hair. The white makeup to pale her complexion juxtaposed by the multiple piercings that covered her face. The cat eye contacts in place to incite disgust. Repulsion. She leaves the only person who loves her despite it all, Linda, her legal guardian. But when she walks into her dorm room, half of which is covered in all kinds of pink thanks to the beautiful, bubbly blonde that unexpectedly disregards her gothness, she has no idea that it was the beginning of another change. The beginning of light shining through the dark abyss that for so long had consumed her. Raven’s determination to hide from the world was not working. Her roommate, Quinn, is determined to get to know her. Her usual tactics of deflection were failing miserably and suddenly she found herself fighting the urge to smile for the first time in years. But it’s a knock on the door that would thrust back into her life the one person she’s never forgotten. Kaeleb McMadden. And it’s at the sight of him that everything she’s worked so hard to bury suddenly threatens to erupt chaotically. As Raven spends time with Quinn and Kaeleb, she slowly starts to come out of the fog, coming into herself, returning back to Aubrey. Aubrey has carried so much pain for so long that it feels so new to care, to live, to have hope beyond her shadowed reality. And before too long, she finds her feelings for Kaeleb intensifying, but does he know who she is? Would he remember? Regardless, Kaeleb is always there, supporting her and caring for her… pulling her out of her darkness. The trouble is that Raven/Aubrey’s progress is fragile. Years of loss and heartache aren’t easily pushed aside and and the sometimes cruel nature of life threatens to destroy everything she’s rebuilt. And as death once again comes knocking, the perfect storm unravels it all. 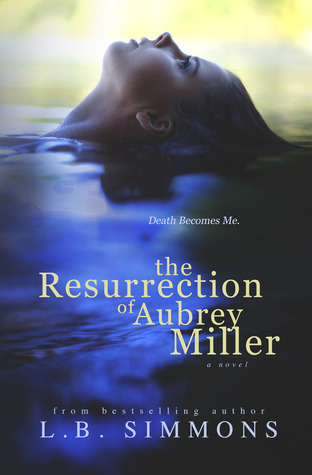 “Grief, anger, and fear solidify into the cold blackness forming within me, its inky tendrils growing and spreading, smothering everything alive within me until Aubrey Miller no longer exists. Only death dwells inside of me and I take comfort in it as it blankets my pain. This story is all kinds of heartache and grief and I truly felt every moment. L.B. Simmons does a great job of creating characters that seem real and vulnerable, making it easy to care for them from the beginning. Although I was able to see some of the plot coming, the power of this book is experienced by the emotional journey this girl takes. There was humor, romance, sadness, sexiness, fear … it truly captured so many of my emotions, holding my attention from beginning to end. This is a standalone book that I assure you, you will read in one sitting. Great review Vilma! I really enjoyed this book.